LED light therapy improves skin tone, reduces visible effects of aging, and helps clear up blemishes. 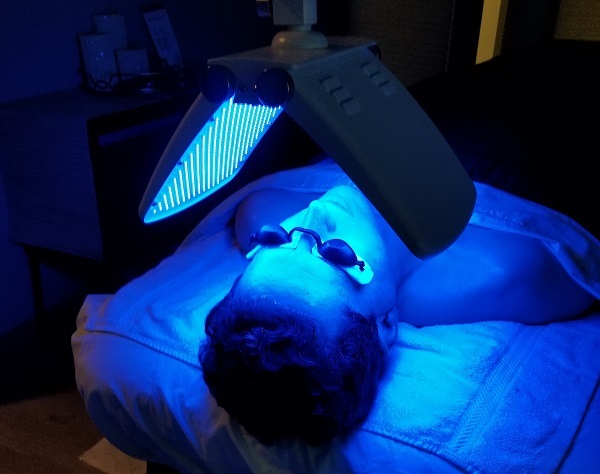 LED light therapy uses specific wavelengths (colors) of light to address the visible effects of aging, acne, and other skin concerns. An LED device is placed close to your face and specific colors of light are shone on your face. The light penetrates into your skin. Each color is believed to have different effects on the skin, according to experts in this article. Red light improves circulation and reduces inflammation, which reduces the appearance of aging. Amber light also reduces the appearance of aging by stimulating collagen and elastin. Blue light kills bacteria that cause acne. Green light has a calming effect and reduces irritation and redness. Individual LED Light Therapy $95. Ideal for improving skin tone, reducing redness, or addressing a sudden breakout. Includes a deep cleanse, customized mask, and excellent finishing products. Series of 6 LED Light Therapies: $450. For acne-related breakouts and anti-aging, where more frequent LED light therapy is beneficial. This is a $20 savings per session over individual light therapy. Series must be completed within 12 weeks and is not meant for occasional light therapies. LED Facial: $135. Look extra-radiant and beautiful. A full facial with LED therapy. Includes a deep cleanse, exfoliation, steam, extraction, a moisturizing hyaluronic acid mask for face and neck, and botanical stem-cell finishing products. Ultimate Anti-Aging Facial: $165. Look younger right away. This is a facial combined with our best anti-aging services: microdermabrasion for exfoliation, microcurrent, and LED light therapy. Includes a deep cleanse, a customized mask, and botanical stem-cell finishing products.